Even though he’s the challenger, it’s a slight surprise to see Tyson Fury priced up as the underdog for his WBC heavyweight title bout with Deontay Wilder at the Staples Centre in Los Angeles on December 1st. Fury’s odds are 13/10 to beat Wilder and extend his pro record to 28-0. 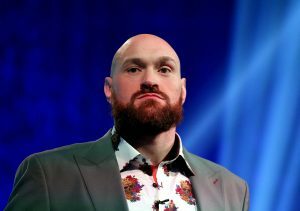 Yet, for any of your mates doubting the credentials of the Gypsy King, here are five persuasive arguments you can offer as to why Fury should be backed to see off the American champion and 4/6 fight favourite. It’s fair to say that Wilder is not the most technically-accomplished fighter. His regular go-to strategy is to use his jab to set up a huge right-hand knockout punch. Wilder has typically used his superior height and reach advantages to control fights and frustrate fighters into making mistakes, as they attempt to get into range to land shots of their own. Also, with these smaller fighters needing to punch up to land on Wilder, this can have a negative impact on the power behind their shots. With Fury taller and possessing a longer reach, Wilder will not be able to rely on the same factors that have served him well in building in his own 40-0 record, of which 39 of these victories have come by way of knockout. Therefore, it will be Fury who is best placed to control the fight with his jab, with Wilder perhaps being lulled into a return to the more unrefined and wild style of his early days as a pro. Wilder was definitely in trouble during the seventh round of his most recent victory over Luis Ortiz in March, with the Cuban lacking the other tools necessary to down the American alongside his skill. Fury is a better-than-average boxer and certainly on Ortiz’s level in terms of skill. However, this is backed up by the size and movement that Ortiz lacked. With these three weapons working in tandem, Wilder may struggle to mount the same level of comeback he did in eventually seeing off Ortiz in the 10th round. Meanwhile, in the second of his successes over Dereck Chisora, Fury even switched to southpaw to focus on dominating with the left straight, which eventually led to a victory when Chisora failed to rise for the 11th round. 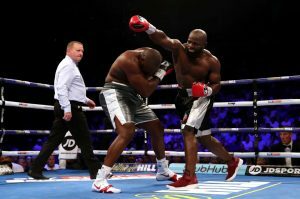 Dereck Chisora might have impressed with his skill against Carols Takam, but he was no match for Tyson Fury. Following on, Fury has a track record when it comes to creating a successful game plan to nullify the strengths of an opponent. When out-pointing Wladimir Klitschko, Fury did a fine job in ensuring an awkward fight, full of stance changes, backhand jabs and back-foot jostling. The fight wasn’t the most entertaining, but Fury did what he needed to in order to win the bout. Expect similar levels of preparation to cancel out the strengths of Wilder. Fury will look to steal rounds on points with his jab while ensuring he’s at little risk of being caught by the champion’s power punch. If Fury’s tactics perplexed Klitschko, there is no reason to disbelief he can’t upset Wilder’s rhythm in the same way. Wilder may possess the greater experience when it comes to title fights, following the seven successful defences of his WBC gold, while he can also fall back on having competed at the Olympic Games when winning a bronze in 2008. However, he didn’t even begin boxing until the age of 20. At the same age, Fury was having his first professional fight and the 30-year-old comes from a family with a long history in boxing. He represented both Ireland and England as an amateur in his teens. Meanwhile, the fact he has previously fought and beaten Klitschko shows a far greater level than anything Wilder has accomplished to date. The American certainly has no definitive victory on his resume. Can Tyson’s big-match experience help him sink Wilder at the Staples Centre? Wilder broke his right hand, alongside tearing a bicep, in a win over Chris Arreola back in 2016, with temporary pins required to repair the damage. He then fractured the same hand during the second of his two victories over Bermane Stiverne. There is a clearly a weakness with this body part, which also happens to be Wilder’s biggest weapon. Should another injury resurface against Fury, it’s difficult to see him being able to stop the challenger.